I had a revelation a month or so ago. I discovered a local trail that I’d never ridden. Finding local trails is always a beautiful thing but I was filled with equal amounts of awe and horror. Awe at the fact I had found a new local trail on my doorstep that would change the way I plan my regular and favourite loops, but also horror at the fact I’ve lived here all my life and been riding this area for 25 years. And I had never ridden this particular trail. What was wrong with me? How did this happen? And I got to thinking about it a lot. I spent the early years of my mountain biking obsession exploring. To me mountain biking was less about what I was riding and more about where it could take me. 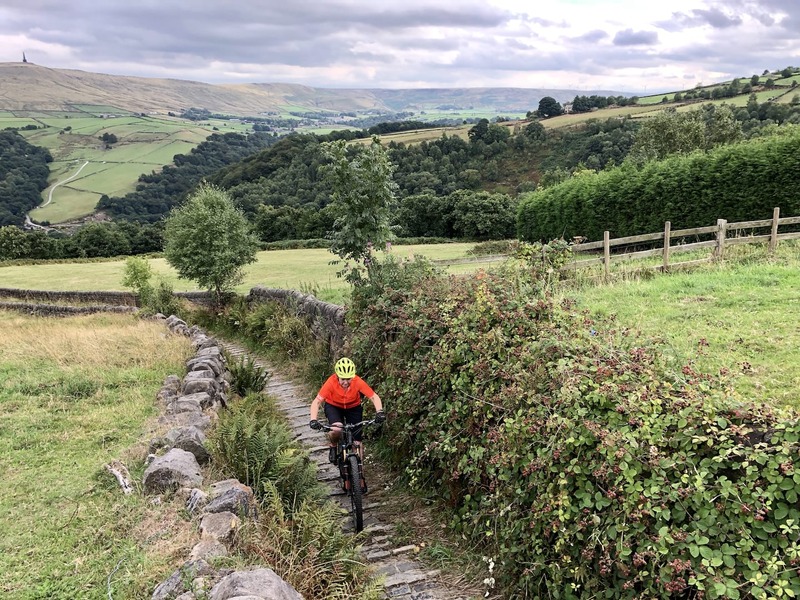 My mountain bike was an enabler – it allowed me to go to places in my local geography that would either be impossible by foot or just take far too long. It was not about what I was riding on but about where I was riding to. Then, at some point I’ve not yet pinned down, that changed and it became a game of technology. I began to focus on the equipment, the clothing, and the performance. My view of the trails I was riding narrowed and became focussed more on the next ten feet and less on the bigger vista beyond that narrowed view to the horizon. I started to think about cleaning that technical section on that trail I really liked. My personal 200 yards of Singletrack was a technical section of lumpy rocks with a multitude of lines to choose from that changed with the seasons and I loved it for that reason. I picked bikes and kit that in my mind would allow me to take better lines and improve my speed on these familiar trails and I gradually changed from explorer to technology adopter. Performance eventually trumped experience. 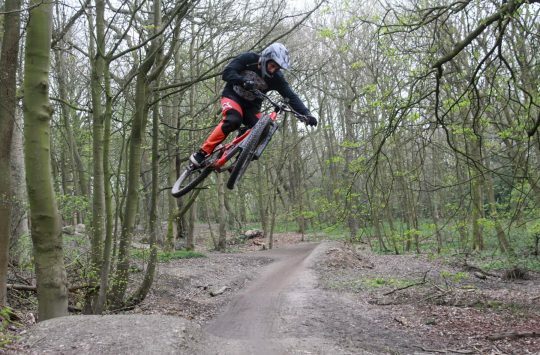 And I think that’s when my knowledge of my local trails stopped developing. 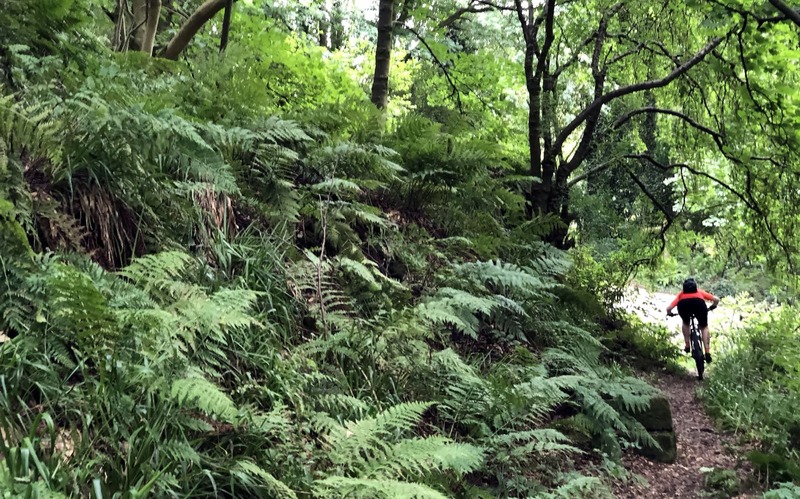 After the shame of being shown a new trail in my ‘back garden’ by someone who’s local knowledge was theoretically inferior to my own had passed I felt something that I had not felt for a long time. That need to explore and to reconnect with the reason fell in love with mountain biking all those years ago. Clearly there was unfinished business to be be completed right here on my own doorstep. If there was one trail I didn’t know about, how many more were there to be discovered? It was time to stop focussing on the bike and start thinking again about where it could take me. You don’t need the latest model for that – what you need is a map and the urge to look. They may show the lines that we can ride but they don’t show the lines that are worth riding. 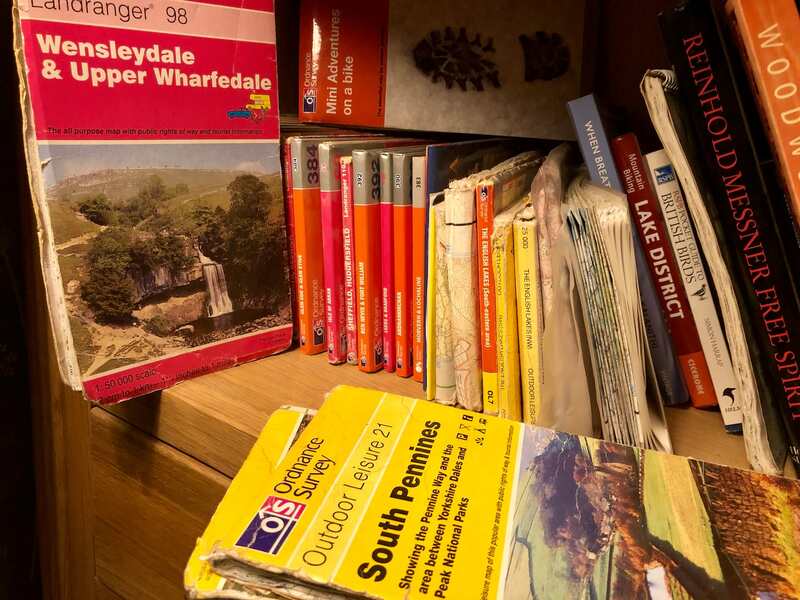 We have a shelf at home and on it is a collection of Ordnance Survey maps. Some are old and tattered, some new and laminated. They all show the lines on which we can ride and for years they were my point of origin for all new exploration. We have maps from all over the UK and several that cover my local area – they are the most tattered – which is why I thought I knew all the lines. The ones that were worth riding anyway. But the problem with these maps is that they are just lines on paper. They may show the lines that we can ride but they don’t show the lines that are worth riding. For that you need greater knowledge that comes from local expertise and friends who have tried them out. Technology enters stage left – once again. At first I started using Google Earth to look more closely at the green dashed lines of the paper maps. That would often help separate the lines that looked worth exploring from those that were just rutted, over grown tracks through a bog, but even they didn’t come with local knowledge or recommendation. But we live in the age of social media and that has allowed the human element to come in to play and provide a platform where we can share our discoveries. Now we can look at a line on a map and check if anyone else has already ridden it. The plethora of riding selfies from friends now means that simple maps themselves are now becoming secondary sources. Our friends and their friends are now the primary sources. Komoot allows you to find and then share your favourite routes and segments. 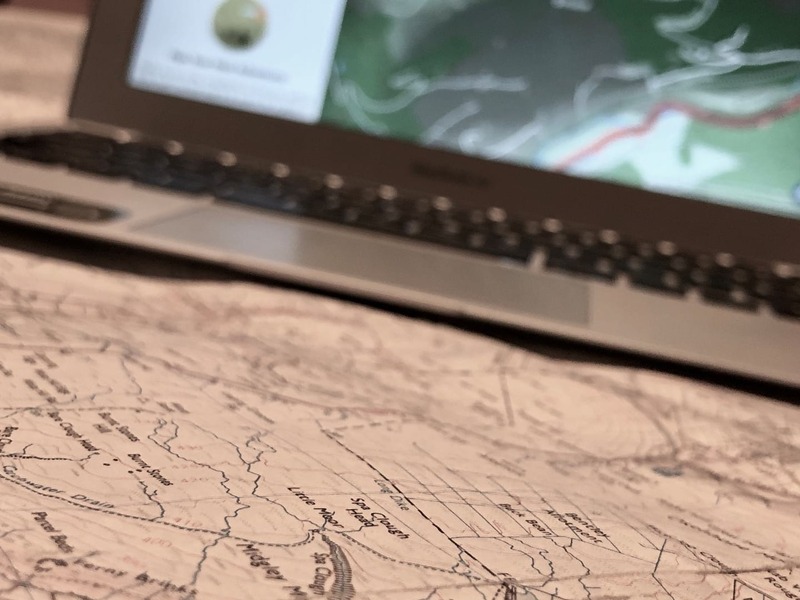 I do admit though that I miss those times spent with a map spread out on the floor looking for a new way to connect up old trails into new loops. But there’s a new way to find trails now. By combining the accuracy of maps with the modern expectation of being able to share everything, apps like Komoot have arrived that allow you to take your newly discovered routes and share them them with other users within the Komoot community. 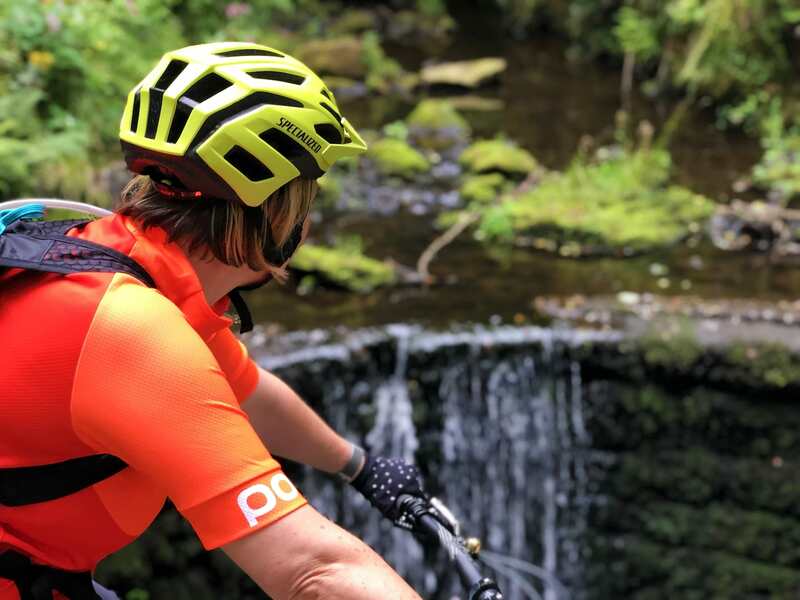 Komoot lets you plan your route based on other mountain biker’s recommendations on what the most interesting trail segments and places of interest are in any given area. These handy tips are red pins on the map called Highlights. 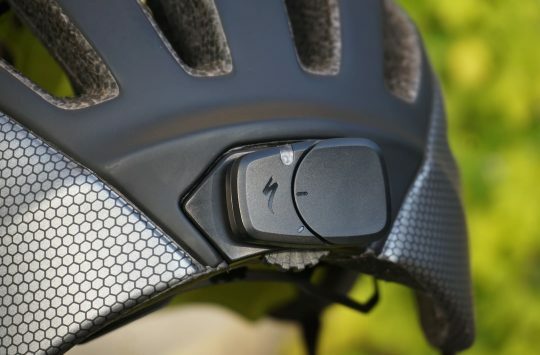 The Komoot algorithm scans the road surface types in the area you want to plan a route, prioritizing trails that suit your type of riding, whether thats XC or more techincal enduro or all-mountain trails. It’s like having a friend lean over your shoulder making suggestions as you plan your next route. And, if you dont want to follow the marked trails, you can plan completely off-grid too. Once your route is saved on Komoot, you can simply use the app on your phone to guide you, with or without turn by turn voice navigation, or sync it with a range of GPS devices via bluetooth or wifi. 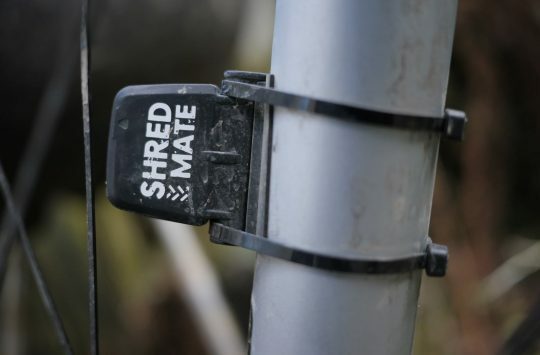 Where Komoot really comes into its own is when you are in unfamiliar territory… gone are the days of scouring over paper maps and speculating on the length of a ride – Komoot predicts your ride time and provides a breakdown of trail surfaces so you can even gauge what tyres you need. It does what a map can’t do and gives you that all important info on whether that line on the map is actually worth riding or not. Once you’ve uploaded your own route highlight, others can add to it. 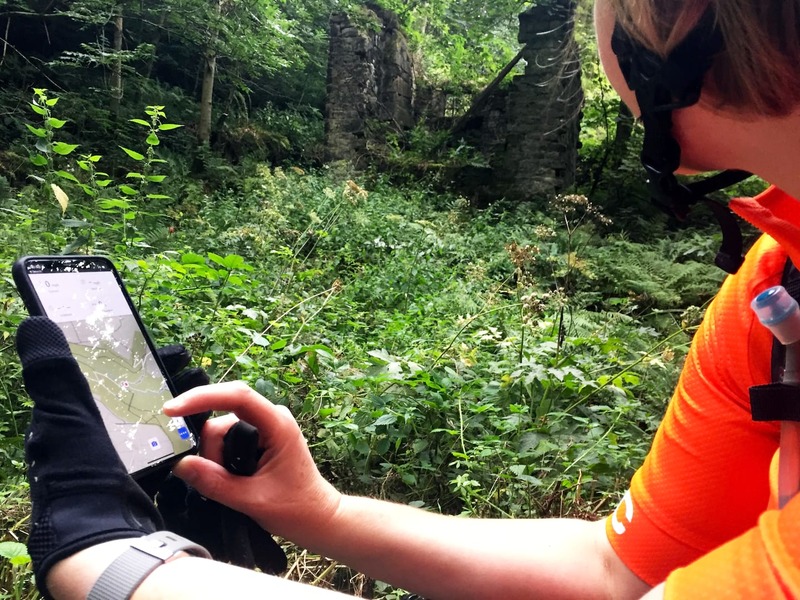 It was armed with this new tool that I sat down one afternoon and once again began to explore my local trails to see if I could find, with the help of those who had already highlighted the best bits , more of those trials I had missed. 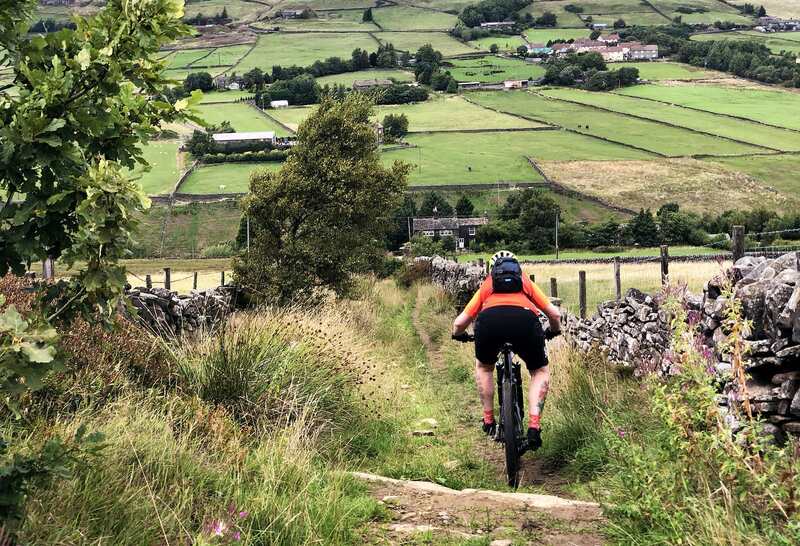 There’s a plethora of trails that drop down into Hebden Bridge and a smaller collection of ascents. These climbs are classics and the most popular tend to be the ones of constant gradient that represent the most efficient way to get the maximum altitude. I’m very familiar with these routes, as I am with the many options to return back down to the valley floor. What it turns out is my blindspot are the other ways you can get to the tops. The first of these was shown to me by Hannah and was a detour from a classic, dreadful climb known as Horsehold. It starts in the centre of the town and is basically a tarmac road that begins as a narrow 1:5 climb and just seems to get worse. But unbeknownst to me about a third of the way up is a trail on the left that zigzags up the hill instead of just ploughing a direct, lung busting line right up it. This new route not only takes the horrendous strain out of the climb but opens up to some of the most spectacular views of the town that I’d (n)ever seen. But that wasn’t the best part. 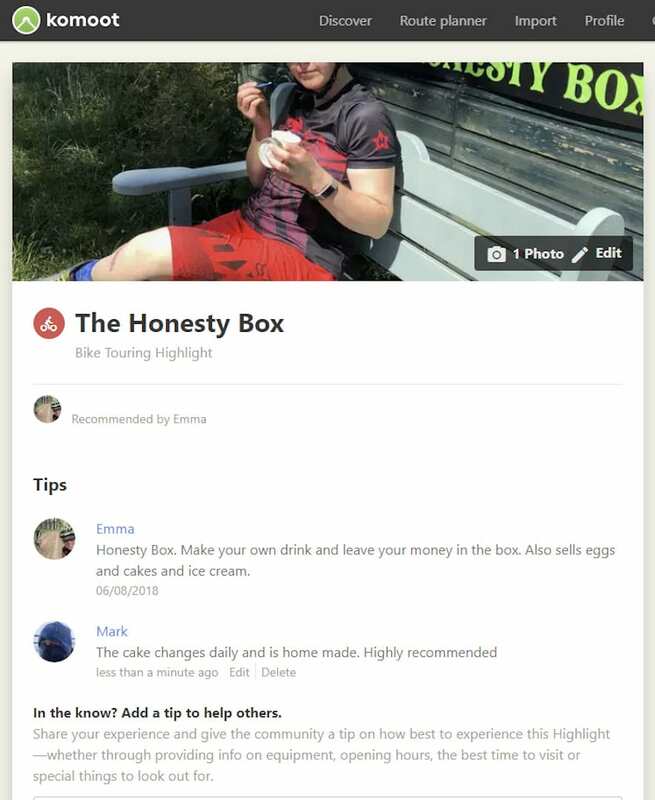 The ‘honesty box’ is something I’d heard people mention over the years but it was always in passing and never in detail. It turns out to be the most amazing wooden hut I’ve come across in my part of the world. 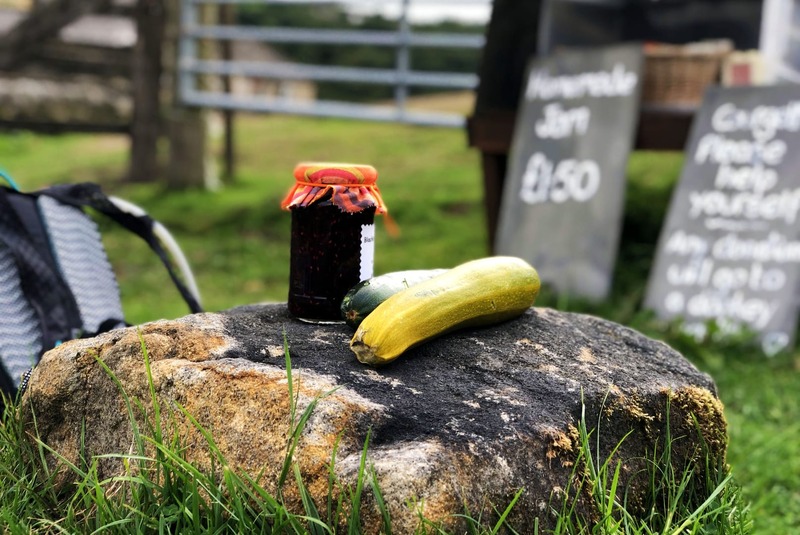 It’s a hut at the side of the trail stocked with food and local farm kitchen baked cakes. There’s even a fresh batch of eggs laid out each day plus, recently at least, free sun cream. Bolted into the floor is a metal box with a small slot for money and above it is a whiteboard with today’s prices. Outside is a bench where you can sit and eat your choices and paying the right amount is down to you and your conscience. There’s a field with lambs next to it and a campsite close by. It’s amazing to me that this is here because I’d never been there before. Settling in front of my laptop and Komoot I started dragging the lines around the local area until loops formed. I’d zoom in and examine the routes, checking out what others were saying about them. The majority I recognised although not always the comments. One rider’s glorious descent is another’s horrendous climb it would sometimes appear. As I expected I recognised all the classic ways down into the valley, but after twenty minutes of pouring over the options a couple of lines appeared that I didn’t recognise. They began by a familiar road and quickly climbed. They came with highlighted images from other trail users, which is a clear sign there’s something here worth exploring. One trail in particular stood out as it began close to a bundle of trails I would have categorised as ‘classically local’. The sorts of trails that get mentioned in the first sentence when a visitor asks for local trail suggestions. ‘Well, of course, Callis Wood is the best way up the climb and gets you straight on to London Road, and from there..’. It’s a conversation I’ve had hundreds of times over the years and had become rote. But now there was a line up the opposite side of the valley and I’d never ridden it. This time it wasn’t just green dashes on a paper map but a line on a screen, seemingly well established as a bike route and had been put there by other riders. Snowy! I can see the steps from here! Familiar landscapes transform into stunning, unknown valleys when you look at them from a perspective you’ve never seen before. I spotted houses buried in the hillside just a few hundred yards from my commute, reached by what looked like the steepest set of steps (Could they be ridden? ), and there were new signposts at junctions off our planned route for bridleways with unfamiliar names – duly noted and targeted for future explorations. 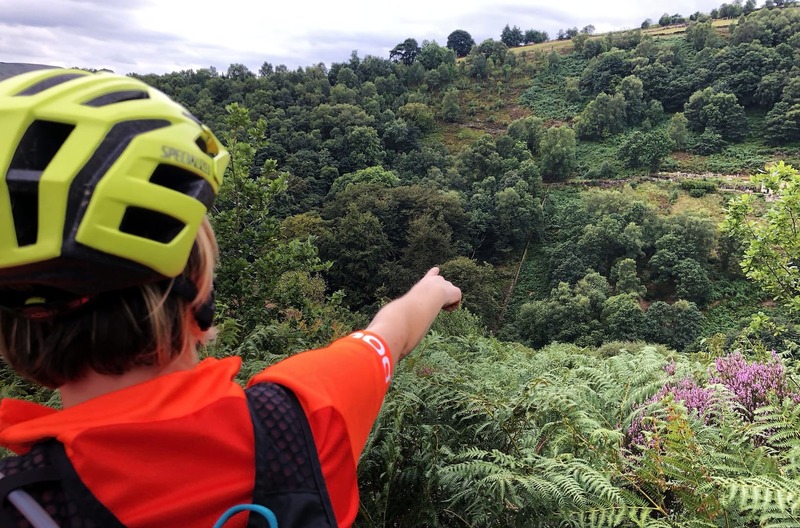 To illustrate my decades of ignorance we passed half a dozen mountain bikers going the opposite way, which served to jolt me to the realisation, as I watched them plummet down the trail behind us, that we’d actually discovered two trails – one going up and one going down. As we stopped by a farm gate selling jam and vegetables (using that same honesty business model again) I pointed out the more familiar trails across the other side of the valley to Vic and together we began plotting a new route, that involved a descent down this one, that would link up and revitalise old trails in new ways. That sense of exploration that I lost a decade ago is back. Triggered not by a nostalgic look through old tattered maps but by a friend leading me where I’d never been before on my own doorstep and then by discovering more through modern technology. Technology that allows us all to spread the wealth of knowledge that we all have stored up inside to help create a greater picture that everyone can reap the benefits of – even if, like me, you have ridden these trails all your life and thought you knew them all. There’s never been a better time to get out and explore, and your best discoveries may yet be found right outside your door. If you hit it fast enough you can make it all the way up the other side. 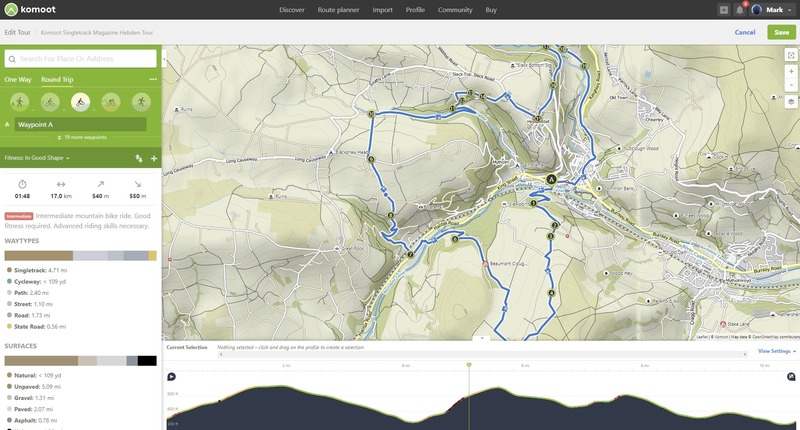 Mark used the Komoot app to discover his undiscovered doorstep trails. You can check out the app here in the iOS store or here in the Android Play store. If you’d like to follow the route described in this feature you can do so here. the west yorkshire mtb vertebrate publishing is a great starter book, once you know a few of those routes, look at the ground and you’ll soon spot different routes going off. Does this app work offline or does data have to be on..? Seems a bit hit and miss, one time it planned a route using a known bridleway, next time it is avoiding the b/w and is sending me on the surrounding roads despite having the mountain bike route option checked. Footpaths used for me too. Despite there being bridleway alternatives. Shame because I liked the sound of the app.